Preheat oven to 350°F. Lightly oil a 9x13-inch baking dish. Add olive oil to a large skillet over medium heat. Add onion and garlic and cook until translucent, about 5 minutes. Add ground beef to the skillet and cook, breaking up the beef as you go, until the meat is well browned, another 8-10 minutes. Season beef with salt, pepper, and chili powder. 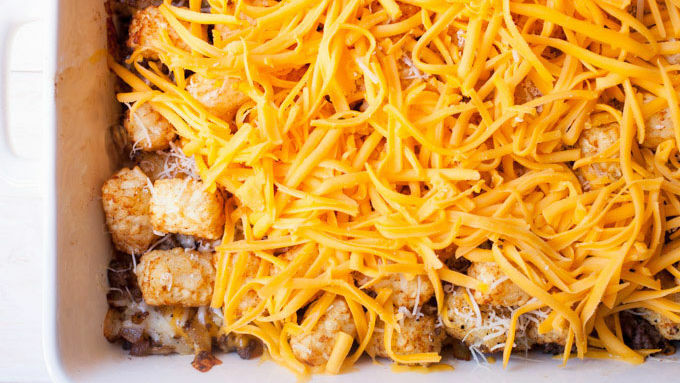 In a large bowl, stir together beef mixture with half of the frozen tater tots, half of the cheddar cheese, and entire amount of Gruyere cheese. Stir very well to combine and transfer mixture to prepared baking dish. 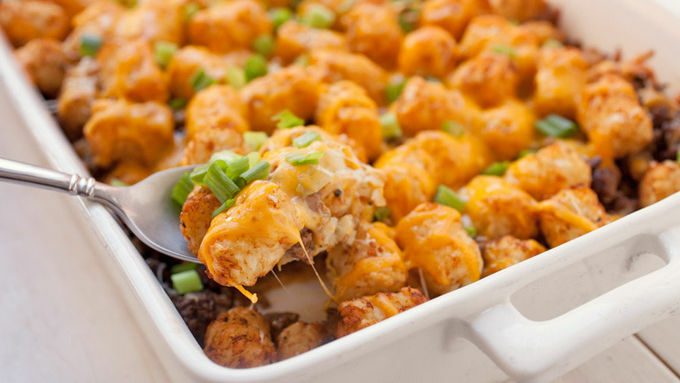 Top casserole with remaining frozen tater tots and bake for 30 minutes. Remove from oven and top with remaining cheddar and grated Parmesan. Return to oven for 15-20 minutes until casserole is hot in the center and cheese is melted throughout. 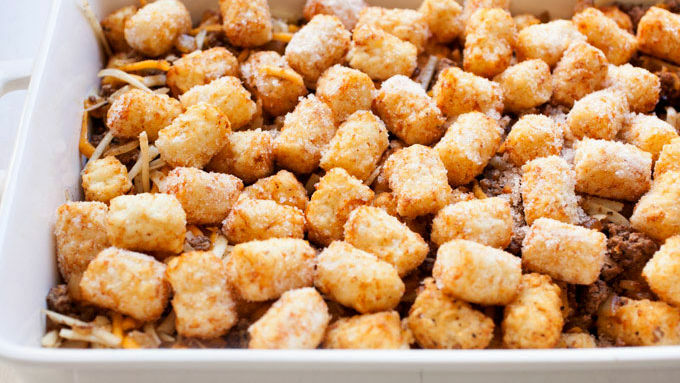 The tater tots should be crispy and golden brown on the edges. Remove casserole from oven. Top with scallions and serve while warm. 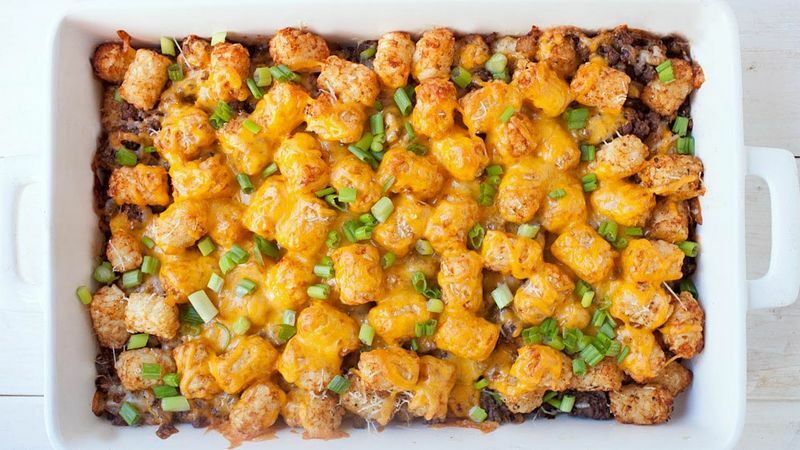 Frozen tater tots are one of my favorite meal shortcuts and you can do so much with them beyond just cooking them according to the package. This delicious casserole uses them as a base but adds a great easy beef mixture and three different cheeses to take the casserole to another level! Because the tater tots are frozen, this will need to bake for a total of 50 minutes or so to cook all the way through. Keep an eye on it as it bakes and rotate pan halfway through if needed to ensure even cooking. Hungry for more? There are more cheesy recipes where this came from.